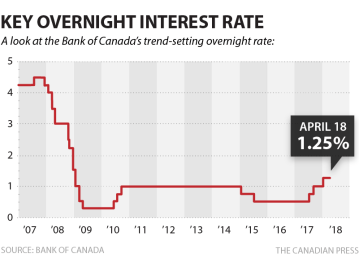 While affirming a tightening bias, The Bank of Canada blinked again today, opting to not raise its overnight rate for the second time in two months, noting the Canadian economy was slightly weaker than the bank had expected in the first quarter of 2018. Its next meeting date is May 30. Meanwhile, despite still relatively low-interest rates by historical standards, stress is already spreading in the highly indebted household sector. “The old guideline was about 30 per cent. Even if you make that 35 or 40, you’re seeing people with 10 or 20 per cent more than that,” Toronto-based insolvency administrator Scott Terrio says of his clients. Trouble is that a quarter of Canada’s population lives in these most debt-stressed Greater Vancouver and Toronto Areas. As real estate and related spending rose far above the norm in the most populous areas over the past few years, it lent a concentrated boost to Canadian economic growth broadly. Likewise, price declines, reduced spending, defaults and stress in these same areas now, should have a similarly concentrated effect on the Canadian economy to the downside.